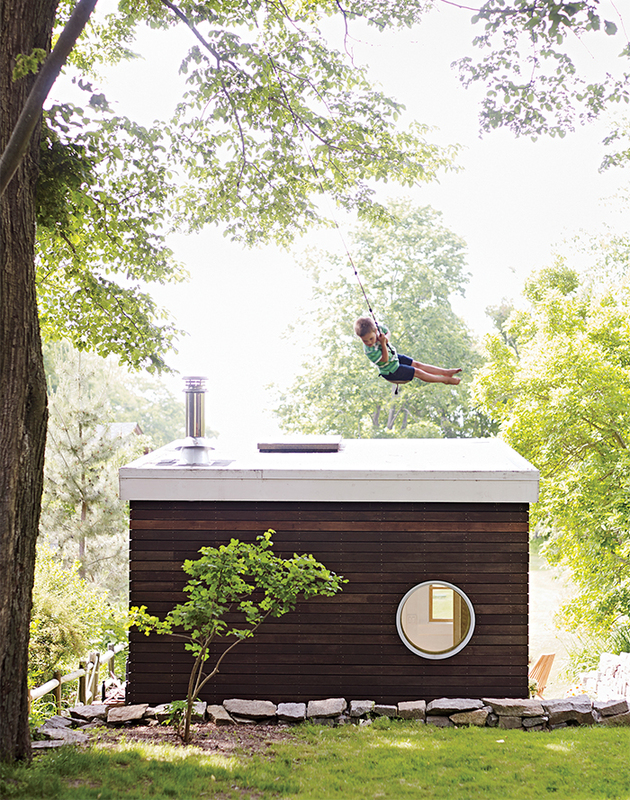 In Massachusetts, a family built a versatile 168-square-foot building. To keep the project close to their $10,000 budget, the family looked for bargains whenever possible. The circular window was a misorder they snagged for 90 percent off from a local building supply store. The mahogany siding is a mix of Craigslist purchases and Dumpster finds. The small, angular guesthouse that architect Todd Saunders designed in coastal Norway is defined by a patio that appears to sit in a cutaway in the spruce-clad volume. The red PS VÅGÖ chair is from IKEA. In Boise, when a renovationed opened up the back of a house, the residents realized there was nothing to see outside. To fill in the view, the architects came up with a glass-walled studio, which is used as her home office. The architects mounted a steel I-beam that spans the yard, with holes drilled at eight-inch intervals for maximum flexibility of use. The prefab Bunkie can be built in units starting at just 100 square feet. This particular structure is about 300 square feet and serves as a yoga studio. This outbuilding built for meditation is just one of several sculptural structures on this Illinois property.